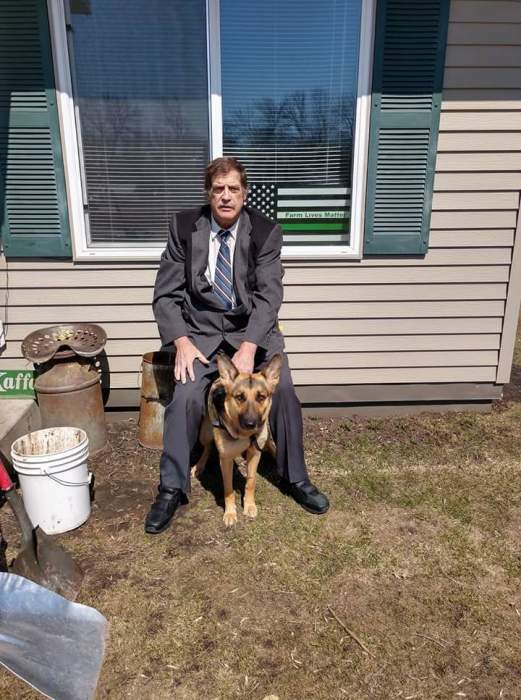 Donny Kaffar, 59 of Grove City, MN, passed away with his faithful service dog Ziva by his side on Wednesday, August 29, 2018. A memorial service will be held at 2:00 PM on Monday September 10, 2018 at St. John Lutheran Church in Atwater, MN. Visitation will be held one hour prior to the service at church. Donald Lee Kaffar, son of the late Paul Kaffar and Rita Kaffar of Humboldt, SD was born June 19th, 1959 in Humboldt, SD. He grew up on the family farm in rural Humboldt, SD and graduated from West Central High School. Donny was united in marriage with Susan Bies on March 31, 1979 and from this union two sons were born, Travis and Lee Kaffar. Donny maintained a career in farming for the remainder of his years. He enjoyed raising and working with his livestock. One of his joys on the farm was working on a Minneapolis-Moline tractor with his Father-in-law Cliff Cline and entering it in the local tractor pulls. Without a doubt, Donny’s favorite mode of transportation was always on a tractor. Grateful for having shared his life are his two Sons - Travis of Sioux Falls, SD, and Lee (Angie) of Dell Rapids, SD; Grandchildren - Haiden and Madison of Dell Rapids; Mother - Rita Kaffar of Humboldt, SD; Siblings - Paul (Belinda) Kaffar of Sioux Falls, SD, Tom (Darlene) Kaffar of Humboldt, SD, Cindy (Dave) Held of Garretson, SD, Tammy (Scott) Kaffar of Mesa, AZ, Connie Kaffar of Tea, SD, Kim (Terry) Manning of Miller, SD, and Mike (Sharon) Kaffar of Spencer, SD. Donny was preceded in death by his father Paul Kaffar, daughter-in-law Trisha Kaffar, and his niece Rachel Ketcham.